For creating sharp, precise lines. This brush has fibers which are carefully arranged to form a perfect angle. M·A·C professional brushes are hand-sculpted and assembled using the finest quality materials. They feature wooden handles with nickel-plated brass ferrules. I had been after this brush for ages before I actually decided to get it. I prefer to see brushes in person, you can't really tell if they're going to be too big or too harsh on your face through a computer screen. This brush is made from firm natural fibers. It's still soft on the eye area, despite having firm bristles. This can be used to fill in your eyebrows, which I have yet to try. (I've kind of given up on my brows at present, more on that in another post!) 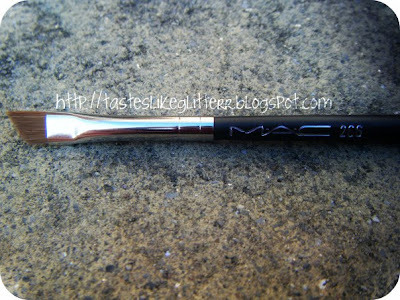 You can also use this for eyeliner, which is what I have been using it for. I've read reviews saying that this can be too thick to do liquid eyeliner on the top lid. I do not find that the case at all. I used it in this FOTD for the black liquid liner. I think that's the perfect line. It's also helped me in achieving even flicks. Before I just used the applicator that came with a liquid liner and it was much to thick to do that. Now I can have perfect lines and flicks. 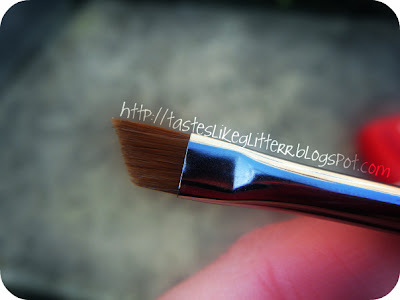 If you have this brush, what do you think of it?